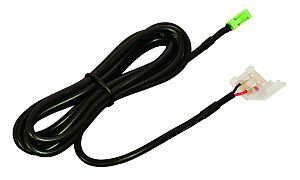 Hafele Loox 3015 LED 24V Starter Lead Connector Cable and clip for attaching the flexible strip lights to driver. For use with the Hafele Loox 3015 24V LED Flexible Strip Lights. Includes 78-3/4" (2m) lead with 24V plug system. Note: This product is also known as HAF-833.77.750, HAF-833-77-750, HAF-833.77.759 on other websites.